I had a good lunch with a good friend and we talked about a lot of things. Work, people and theology. I was sharing with him some of the stuff I was reading, and he commented that he needs to build good knowledge in the Word with the birth and upbringing of his young son. But he felt that the foundational and biblical education in churches are found to be wanting. Based on his experience, he felt that most of what was taught and practiced are not biblical, but anecdotal and based on the people's own interpretation. I could not disagree more with him because I have seen that happening as well. But I still insisted that he needs to find a way to get himself grounded in the basics of the Christian faith, both in systematic and biblical theology. 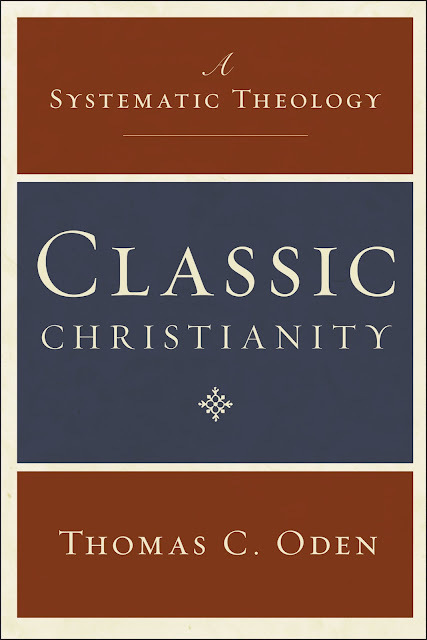 When I got home, and upon completing Wright's book that have kept me reading for far too long, I began browsing through Thomas Oden's Classic Christianity. I started reading the preface, and felt this is the exact thing that he needs. This volume is a combination of originally three books: The Living God, The Word of Life and Life in the Spirit, and with that, this single volume is more than 900 pages long in print. But it took Oden three decades getting these volumes together. He aimed to "set forth key constructive arguments of two millennia of ecumenical Christian thinking—that God is, who God is, and what that means for us today." He sought to "seek an internally consistent statement of classical Christian thinking about God so as to provide a reliable foundation for baptism, the life of prayer, scripture studies, and for the living of Christian life." This is an excellent study of systematic theology at its best bringing together a consensus of Christian thought, interpretation and beliefs. The method of consensus hinges on the fact of wide consent (consentio, “to be of one mind, to agree,” from con-, “with,” and sentire, “feel” or “sense”). Who gives consent in this consensus? The whole church, the cloud of witnesses. How is this consent defined? In correspondence with ancient ecumenical consent as found textually in the ecumenical councils. Each doctrine has a lengthy history of controversy. That history is the subject of historical theology, but that differs from the method of a compendium of classic Christianity, which assumes that it is useful to set forth classic Christian thinking cohesively without becoming disrupted or preoccupied with each successive stage of development through which each teaching has passed in various contexts, traditions, symbol systems, and periods. This compendium is the first in many years to view systematic theology as a classic treasury of scriptural and widely received patristic texts that point toward this distinctive work of the Spirit: These texts all share a common classic premise that it is the same Spirit who inspired the canonical text who is actively creating the unity and cohesion of the whole doctrinal effort amid changing historical circumstances. This cohesion is not the product of the work of modern scholars, but of the work of the Spirit throughout twenty centuries of intensive, critical scriptural exegesis. This volume is the first in recent decades to attempt to present a text-based consensus of early Christian thought that embraces the whole range of issues of systematic theology. It presents a consensual argument that appeals to authoritative texts shared by Protestants, Catholics, Orthodox, classic liberal, evangelical, and charismatic believers. Most comparable attempts address only one or two of these audiences. 900 over pages, thirty years of work, and two millennia-old worth of classic consensual ecumenical teaching. What an important book to read.